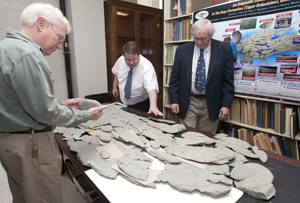 UC Paleontologist David Meyer, left and Carlton Brett, right, flank Ron Fine, who discovered the large fossil spread out on the table. For 70 years, academic paleontologists have been assisted by a dedicated corps of amateurs known as the Dry Dredgers. Recently, one amateur found a very large and very mysterious fossil that has the professionals puzzled. Around 450 million years ago, shallow seas covered the Cincinnati region and harbored one very large and now very mysterious organism. Despite its size, no one has ever found a fossil of this “monster” until its discovery by an amateur paleontologist last year. The fossilized specimen, a roughly elliptical shape with multiple lobes, totaling almost seven feet in length, will be unveiled at the North-Central Section 46th Annual Meeting of the Geological Society of America, April 24, in Dayton, Ohio. Participating in the presentation will be amateur paleontologist Ron Fine of Dayton, who originally found the specimen, Carlton E. Brett and David L. Meyer of the University of Cincinnati geology department, and Benjamin Dattilo of the Indiana University Purdue University Fort Wayne geosciences faculty. Fine is a member of the Dry Dredgers, an association of amateur paleontologists based at the University of Cincinnati. The club, celebrating its 70th anniversary this month, has a long history of collaborating with academic paleontologists. 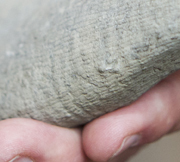 The layer of rock in which he found the specimen near Covington, Kentucky, is known to produce a lot of nodules or concretions in a soft, clay-rich rock known as shale. Fine was reminded of streamlined shapes of coral, sponges and seaweed as a result of growing in the presence of water currents. For more than 200 years, the rocks of the Cincinnati region have been among the most studied in all of paleontology, and the discovery of an unknown, and large, fossil has professional paleontologists scratching their heads. To answer that key question, Meyer said that he, Brett, and Dattilo were working with Fine to reconstruct a timeline working backward from the fossil, through its preservation, burial, and death to its possible mode of life. A close-up reveals the intriguing texture of the seven-foot-long specimen. It has helped, Meyer said, that Fine has painstakingly reassembled the entire fossil. This is a daunting task, since the large specimen is in hundreds of pieces. Even then he still had to guess as to the full size, because it required countless hours of cleaning and reconstruction to put it all back together. Meyer, co-author of A Sea without Fish: Life in the Ordovician Sea of the Cincinnati Region, agreed that it might be the largest fossil recovered from the Cincinnati area. As Meyer, Brett and Dattilo assist Fine in studying the specimen, they have found a clue to its life position in another fossil. The mystery fossil has several small, segmented animals known as primaspid trilobites attached to its lower surface. These small trilobites are sometimes found on the underside of other fossilized animals, where they were probably seeking shelter. “A better understanding of that trilobite’s behavior will likely help us better understand this new fossil,” Fine said. Although the team has reached out to other specialists, no one has been able to find any evidence of anything similar having been found. The mystery monster seems to defy all known groups of organisms, Fine said, and descriptions, even pictures, leave people with more questions than answers. The presentation April 24 is a “trial balloon,” Meyer said, an opportunity for the team to show a wide array of paleontologists what the specimen looks like and to collect more hypotheses to explore. 2 Comments on "“Godzillus” Fossil Discovered by Amateur Paleontologist"
Check the Museum in Big Stone Gap, Wise County, Virginia. If they have not been filed into infinity, there are many specimens like this one at the institute. Various fossils have been found in the shale areas of near-by coal mines and on private land for over at least 60 years. The Museum was, at my last visit decades ago, very small without much of a staff. My father, with others of the community, personally found several fossils and donated them to the museum in the 1950s and 1960s. The fossils, after so many decades, may have been stored or donated to other museums, but there still should be records. I have seen small versions of this textured fossil in our creek near Shepherdsville, KY. Not as flattened. I assumed it to be a plant or plant part like the crinoid fowering body we find as well.